POLYPIPE Manufacturer's Product Code: WP17G. 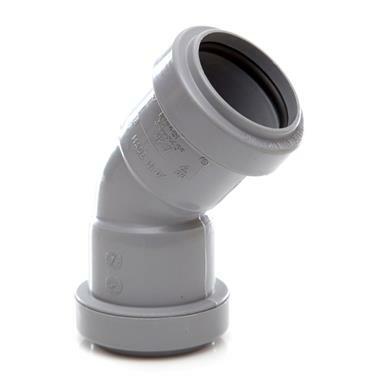 POLYPIPE Push-Fit Waste Fitting - Ø32mm (1 1/4") Double Socket 45 degrees Obtuse Bend; Grey. - Polypipe Push-Fit Waste obtuse bend, used for joining waste pipes at 45 (135) degrees angle. - Connections: Push-Fit Socket x Push-Fit Socket; NOT suitable for solvent welding. - Material: Polypropylene; Manufactured to BS EN 1451-1. - Note: Polypipe soil and waste systems are suitable for short intermittent discharges of hot and cold water in normal domestic installations in the UK. They are not suitable for continuous discharge at elevated temperatures.